Time for another board game post! 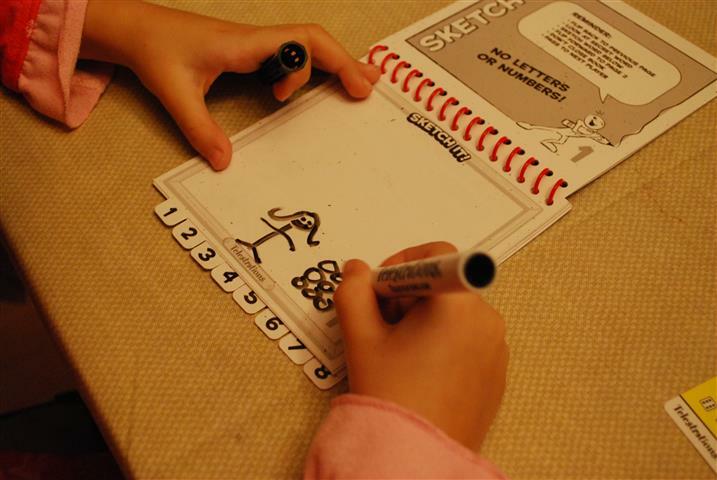 This one is on Telestrations – a fun party game that our kids really love. We learned about this game when we were invited to spend a weekend at a cottage this summer, belonging to Gal Smiley’s best friend RingetteGirl. We had a fantastic time and Telestrations was a big part of that – we came home and immediately went out and bought a copy (we found it at Chapters). I believe the box says ages 12 and up, and I can see why, as there is some reading involved and some knowledge of phrases. But I would definitely say anyone 10 and up could handle it, and we play this with Little Miss Sunshine, who is 7, with some modifications (discussed below). 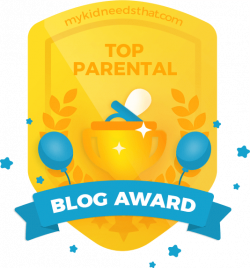 It’s a big messy party game and that means it’s best for a whole whack of people. In theory you can play with as little as 4 people but it’s definitely better with at least 5, and if you can get 7 or 8, that’s best. 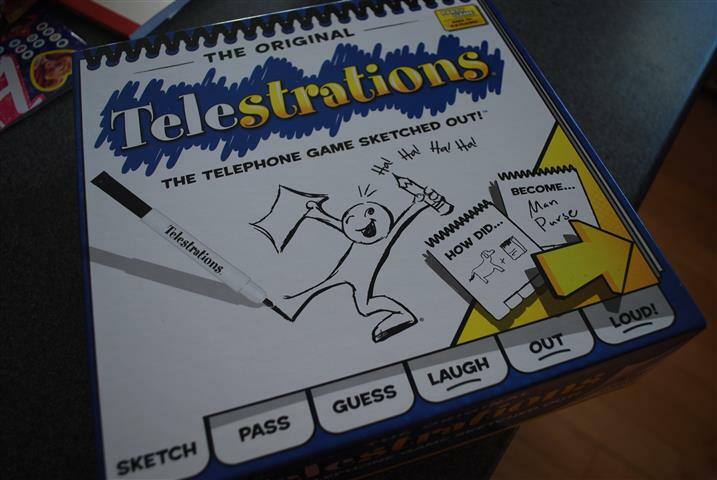 Telestrations is advertised as “the game of telephone, with drawing” and that’s pretty accurate. A card will give you a starter word or phrase, and you write that phrase down in a little notebook. Then you pass the book to the next person at the table, and that person has to draw a picture of the word. Then the book is passed down the line, and the next person guesses what the picture is (i.e. writes a word that they think was the original word). Then the next person draws THAT word, and then the next person guesses based on THAT picture, and so on. As you can guess, the original word/phrase gets pretty warped, pretty quickly, with much hilarity. Once the notebooks have made it all around the table, the original person presents their notebook one page at a time – “My word was Rocking Horse, and then Sam drew this (ha ha ha! ), then Sally guessed it was a bow and arrow, then John drew this…” and so on. Everyone gets a notebook to start, and they’re all going around the table at the same time, so at the end, everyone has a notebook to present, so we take turns until they’re all shown. There’s technically a way to “score” the game and have a winner. You can earn points for correct guesses; for getting someone else to correctly guess your picture; and for having your original word make it all around the table more-or-less correctly. 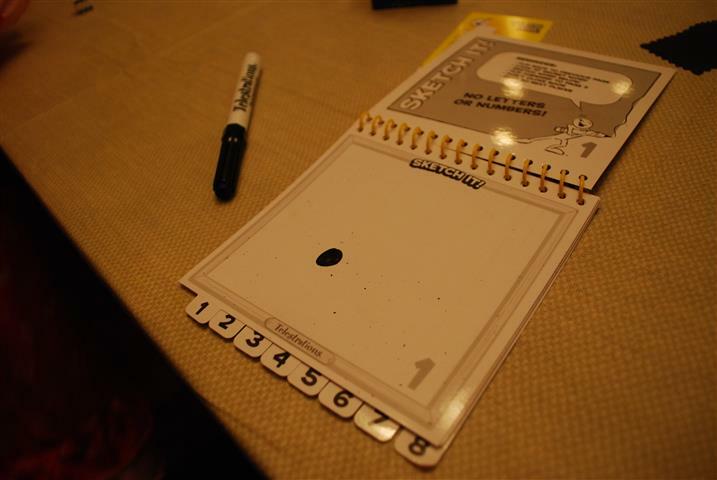 But we don’t bother with this – Telestrations is just a game we play for laughs and fun. Also, there’s a timer that’s supposed to limit your drawing time, but we don’t use that either – everyone has unlimited time to draw. Sometimes this means a few notebooks collect at one person’s station but so be it, it works out in the end, and if you’re waiting for a book to be passed to you it’s only a good excuse to eat some chips. Mostly we play this game for the hilarity factor. There’s three types of fun – admiring people’s artwork, laughing at crazy artwork, and laughing at the ridiculous things people guess. Then the Big Brother guessed “Circle of Doom” and passed it to me, and when I opened the book and saw “Circle of Doom” as the next thing I was going to have to draw, I just about fell out of my chair laughing. It was AWESOME, and kicked off a whole evening of the Captain, Sir Monkeypants, and Big Brother trying to outdo each other with crazy guesses (“Monkey with pickaxe in bathtub wearing a top hat”). Lots of people we have tried to play this game with have refused because they “can’t draw.” Really, bad drawing is 3/4 of the fun, so we usually push them into it. Plus, the fat markers on a small square mean even the most gifted artists can’t create masterpieces – everyone is just trying to capture the idea quickly with stick figures and simple shapes. But you have to make sure that the Bad Drawers at least have a sense of humour and can handle being laughed at. We have a solid track record of fun with this game but we did play one time with a lady who will remain nameless, who had played the “can’t draw” card to begin with, then felt very upset when we laughed at the mismatches. So yes, know your audience (and some alcohol wouldn’t hurt either). I think this is a really fun game for all ages, but there is some reading involved, and also some knowledge of phrases like “out of the box” or “feeding frenzy” or “inside man.” Gal Smiley does just fine – when we first got this game last summer, she was 9 1/2 – but the Little Miss needs some help. Here’s how we handle it for her – she sits always between two adults. If the person passing her a book has written down a word, then they will whisper the word to her, and sometimes give a little explanation of what it means; then she draws her picture. If she receives a picture and needs to write a word, then she asks the person she will be passing TO for help with spelling, as they’ll be reading the word next, anyway. It has to be kept hush-hush as the other people at the table aren’t supposed to hear any hints about what’s in the books, so sometimes we will play music to cover up our whispering. It works out well and she loves to play, so all good. Big groups in fun, party like situations – perfect for cottages or family reunions or Christmas parties. You can play this one really quickly – a round takes maybe 15 minutes, so you can throw in a few rounds before bed with no trouble, and you can play for as long or as short as you like. It’s a great choice for people who might not want to play a game with a lot of strategy or thinking, but just want to have a little icebreaking kind of fun after dinner. If the relatives are coming for a visit – pick up a copy! We play this at a friend’s house. It’s awesome. We never keep score though. OMG, that sounds awesome! We hang out with a group that loves games like Munchkin and Risk and Clue and they make me want to stab my eyes out with a shrimp fork, but I like trivia games or Cranium, and this sounds like another one we should add to the mix.